Oceanside Pirates (14-0) 37, Edison Tigers (12-2) 22. OCEANSIDE (12/12/2014) Senior Josh Bernard put up three touchdowns on the ground as the Oceanside Pirates defeated the Edison Tigers of Fresno in the CIF Southern California Regional Championship. The win earned the Pirates a trip to the StubHub Center in Carson where they'll take on the Folsom Bulldogs (15-0) in the Division I State Championship next Friday at 8 p.m. pacific time. This will be the Pirates' third state championship appearance in school history. They won state titles in 2007 and 2009 under head coach John Carroll, who was honored this week with the stadium being renamed after him. St. Margaret's Tartans (15-0) 48, Christian Patriots (13-1) 21. 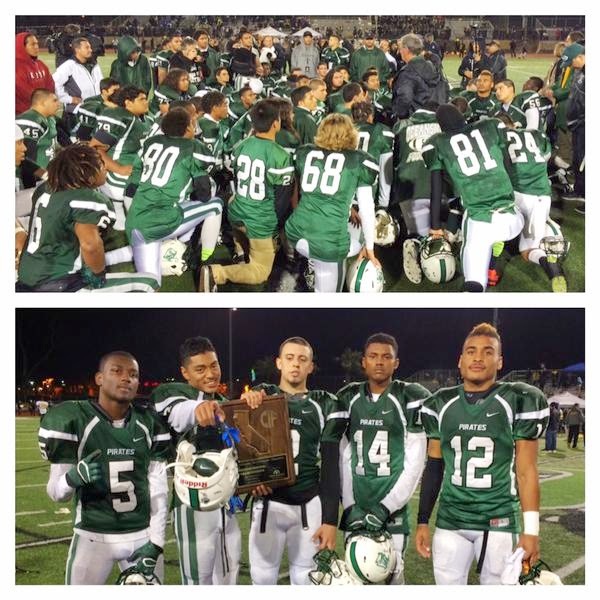 EL CAJON (12/12/2014) Christian's 20-game winning streak, which was the longest in the state, has come to an end after suffering a hard fought loss to St. Margaret's in the CIF Division IV Regional Championship Bowl at Granite Hills High. After trialing 28-7 late in the second quarter, the Patriots answered back with a 69-yard touchdown pass from David Jeremiah to Nick Sexton, followed by a 21-yard touchdown run by Adrian Petty that cut St. Margaret's lead to 28-21 with 7:27 left in the third quarter. An interception by Trevor Howell gave Christian a chance to tie the game, but a turnover on downs led to George Krantz completing a 68-yard touchdown pass to Nick Shanks. Not to be outdone by his play making ability on offense, Shanks would find the end zone again on the ensuing drive, picking off Jeremiah's screen pass and returning it 56 yards for a touchdown.